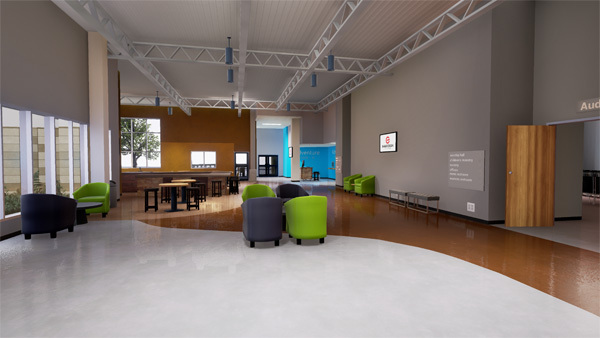 Not too long ago we completed a full suite of services for a new development project being undertaken by Eagle Creek Church, a non-denominational Christian Church based in Lee's Summit, Missouri. 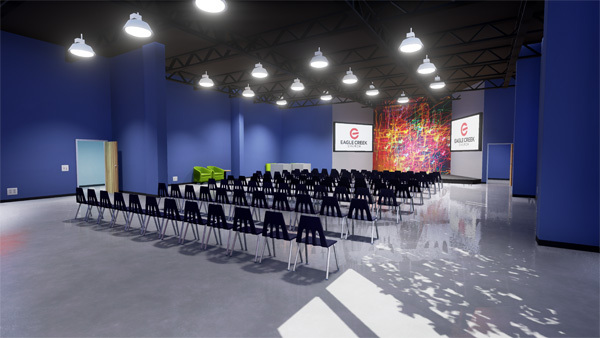 Eagle Creek Church incorporate high energy music into their sermons and run exciting kids programs, and so need a lot of space to spread out in, and a church building that incorporates many different types of spaces. 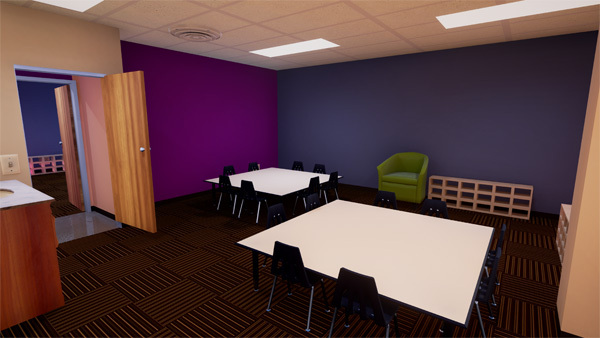 As part of their project, to begin with we took their initial drafts and designs, and turned them into 3D renderings and a flythrough animation. Their designs went through several iterations. This is one of the beautiful thing about working in three dimensions, rather than solely with flat architectural illustrations. By seeing your designs in the colours and textures you think will work, you can tweak your designs in real time until you are happy with them, saving you a lot of money in wasted interior decorating! 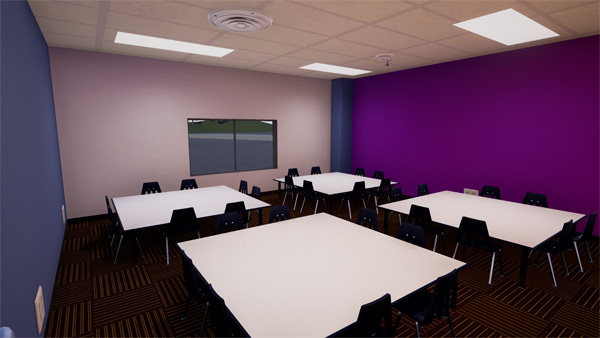 Eagle Creek Church also opted for our 360 virtual reality option for their renderings. This option allows the project manager and their stakeholders to go an extra step beyond the 3D flythrough animation of the development. 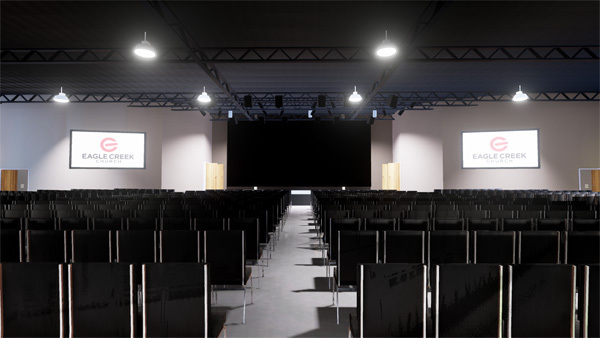 In our animations the motion is controlled by one of our rendering specialists. Imagine for example you have a camera on an invisible track running through a building. The camera can go everywhere the track goes, but if you want to stop it, slow it down, go somewhere else in the building then the animation needs to be redone. With our real estate VR option however, all you need is a virtual reality headset (we're giving them away free until stock runs out) and you can literally inspect every corner of the development as if you were standing in a real building. 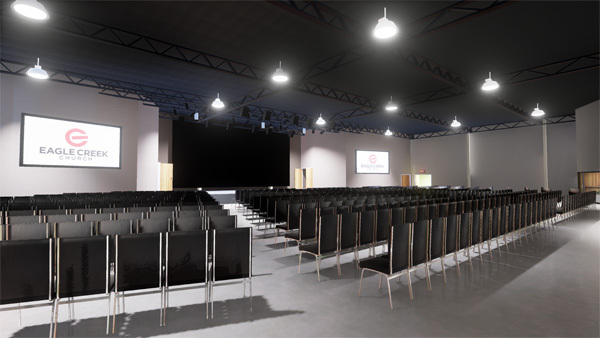 Below you can find the 3d animation we did for Eagle Creek Church's new development, a gallery of 3D renderings, and the VR file. If you just want a quick overall view of the proposed development, or have never seen a flythrough / walkthrough animation before - check out the following short video. 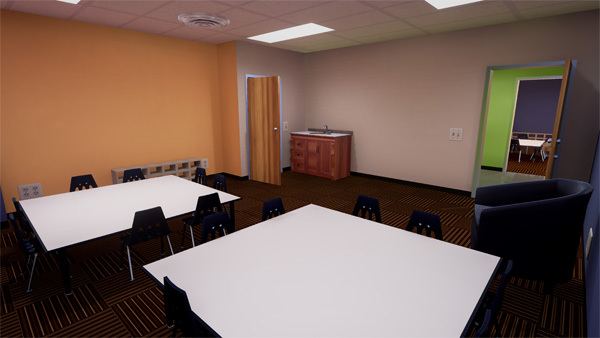 3D rendering software + the skills of our talented designers + your imagination is immensely powerful. Basically the skies the limit (and with the flythroughs we can put you as far up in the sky as you want so you can see your proposed development in context of its surrounding environment). 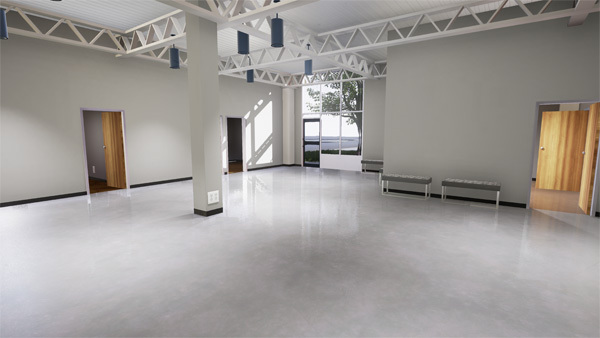 If you'd like to take a closer look at some different aspects of the exterior and interior of the building, check out the following renderings. Depending on your needs and budget we can design in varying resolutions (although we always aim to give you the best possible quality and value for your money). 3d software has progressed to the point where in some instances it's almost impossible to tell the difference between a photograph and a 3d rendering. See for example the detail in the fire sprinklers in the roof in the men's bathroom, the glow from the lights in the main stage area, the shadows and reflections on the linoleum and more. 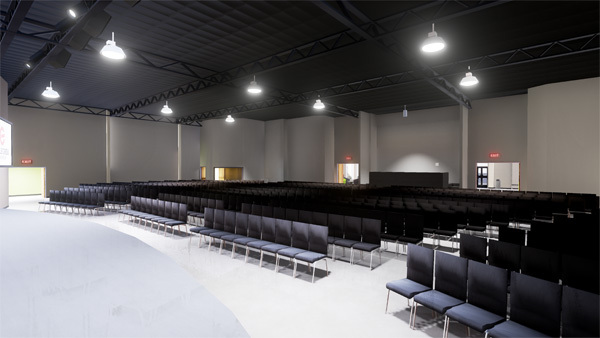 Finally if you have a VR headset and would like to take the virtual reality file of the Eagle Creek Church for a spin you can use the file below. You can either navigate through it in two dimensions, or click on the virtual reality mask symbol to go through the building in 3D. Move between the rooms using the arrows, and then explore however you would like! The only service Eagle Creek Church didn't go with (because they had no real need for it given how interior focused their project was) were our 3D printed architectural models which you can check out in more detail on that link. Hopefully seeing all the finished artwork of different aspects of a 3D development project has given you some inspiration for what you can do in your next project. You might be surprised just how quickly we can turn work like this around, in a matter of days in some instances. And even better if you call or email us we'll get back to you with a quote in 5 - 10 minutes! Newer PostMatterport & Render3DQuick WILL change the REAL ESTATE industry as we know it! Older PostHave you ever seen a church like this?